I am yet again confronted by the question of whether or not something is CTMQ-worthy. I think we all now know that that mythical dividing line keeps getting pushed back further and further. 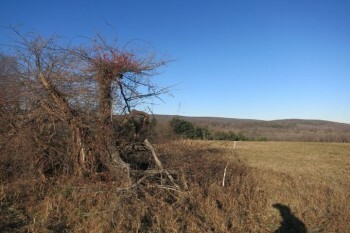 EdHill and I were just driving around the bucolic eastern Connecticut countryside on our way to Frog Rock, minding our own business. Then, out of nowhere, came the unexpected pleasure of gazing upon what is, depending on your source, “The oldest Connecticut church in continuous use,” “the oldest ‘still standing’ CT meeting house,” “the oldest ecclesiastical building in the State of Connecticut, or all of the above. Whatever it is, it sure is New Englandy and it’s important enough to be on the National Register of historic places. 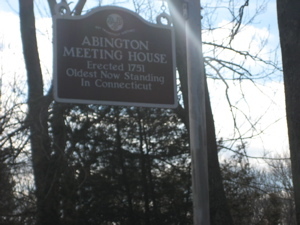 Yes, the Abington Congregational Church is the oldest ecclesiastical building in the State of Connecticut which isn’t really CTMQ-level info, but here it is anyway. The State has installed an official historical marker across the street from the church. 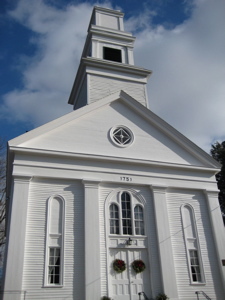 It was built in 1751, and is one of the few surviving examples of the peg and beam construction typical of 18th century New England. In 1977 it was included on the National Register of Historic Places. Notably, it is across Route 97 from a 1750’s cemetery that houses 80+ Revolutionary soldiers.